Ken Tanabe (442nd) of Gridley. MARYSVILLE — Before a standing-room-only crowd at the Marysville Buddhist Church Annex on Sept. 15, four surviving veterans and 15 deceased veterans were awarded replicas of the Congressional Gold Medal for serving in the 100th Infantry Battalion, 442nd Regimental Combat Team and Military Intelligence Service during World War II. House and Senate leaders of both parties awarded the Congressional Gold Medal to the three Army units in Washington, D.C. last November. Since then, regional ceremonies have been held across the country for Nisei veterans who were unable to attend the main ceremony. Other California ceremonies have included San Jose, San Francisco, Sacramento, Fresno, Los Angeles and San Diego. In the search for eligible veterans, the Marysville JACL sent out a newsletter with an application form to the Japanese American community six months prior to the celebration. The organization regrets that no one way is perfect and there may have been eligible persons who fell through the cracks. Opening remarks were given by Marysville JACLer Roy Hatamiya, whose first cousin Frank was among the honorees. The Beale Air Force Base Honor Guard presented the colors. Rep. Wally Herger (R-Chico) addressed the crowd and presented the medals to the veterans and surviving family members as Hatamiya gave a brief profile of each honoree. Among them were three pairs of brothers: Frank and Shig Komatsubara, Shiro and Tim Tokuno, and Akiji and Toshiro Yoshimura. Dr. Isao Fujimoto, professor emeritus of ethnic studies at UC Davis, gave the keynote speech on the accomplishments of the three units. 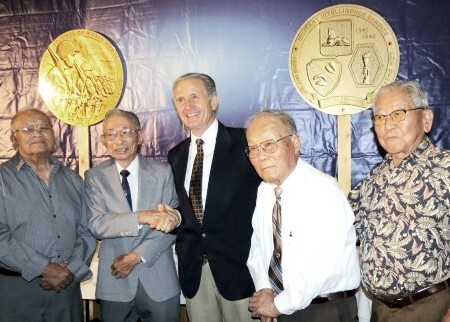 Accepting the medals in person were George H. Inouye (MIS), Yutaka Nakatani (MIS), Jiro Okikawa (MIS) and Kenneth T. Tanabe (442nd). Those recognized posthumously were: Harry Fukumitsu (442nd), Frank Ichiro Hatamiya (MIS), Koe Hinoki (MIS), Richard Kinoshita (442nd), Frank Komatsubara (100th), Shig Komatsubara (MIS), Robert Matsumura (100th), Joe Nakamura (442nd), John Satoru Oki (100th), Jack Shigeo Tanimoto (MIS), Shiro Tokuno (MIS), Tim Tokuno (442nd), Mitsuma Yokohari (442nd), Akiji Yoshimura (MIS) and Toshiro Yoshimura (MIS). The Placer JACL plans to hold a Bronze Star and Congressional Gold Medal ceremony on Saturday, November 10, 2012 at 10 AM at the Rocklin Community Center, 5480 5th St., Rocklin, CA. For more information, contact Gary Hongo at shongo@surewest.net.